how close to the pumpkins sound does this go dyou reckon? Is it based on any particular muff variant? is the DPDT an ON-ON-ON or ON-OFF-ON. with the first pole being 1,2 and 3 (2 is the common) and the second pole being 4,5 and 6 (5 as the common). The the first cap is soldered in between 1 and 4, the second cap is soldered between 3 and 6.
thanks for the info man! I just ordered these parts, im excited to build this one. Ok I have one more question... 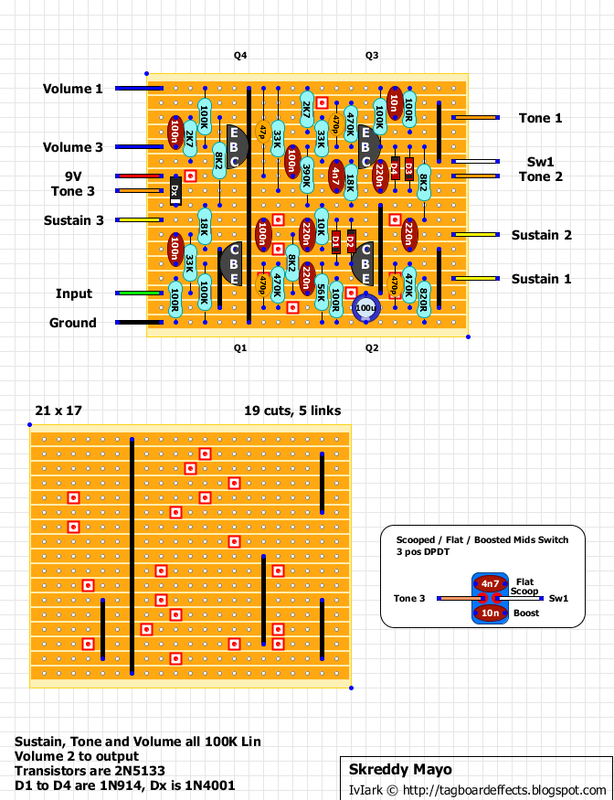 I have already build the circuit, so what I need to know now is how do I wire in the sustain, volume, and tone? Am I wiring like...sustain 1 to terminal 1... sus 2 to term 2... etc? I just want to be sure? If this is right, am I just leaving the middle terminal blank on the volume? thanks for the help and putting up with my ignorance! Volume 2 will go to the stomp switch and is the circuits main output (after attenuation by the volume pot). Ok so I wired everything up and Im not getting a signal. I checked my solder connections, checked in/out lines, knob wiring, layout placement, cuts and links, diode orientation... Im stumped on this one. Is there a way to fix this? I did this on perf board instead of vero but that shouldnt matter as long as I connected the leads, right? Can you post a high res front and back pic, or email them to turretboard at hotmail dot co dot uk and I'll see if anything jumps out at me. I am running tone3 to the on-off-on switch, then running a wire from the switch to the tone pot. is that proper? I'll see if anything is obvious in the pics, but one of the switches commons (centre lug) goes to Tone 3 as you say, the other goes to the collector of Q3, marked Sw1 in the layout. So yes if you've just daisy chained one side of the switch and Tone 3 that is fine. I know ive done the layout properly, if you can find something, let me know. Ive checked it almost 50 times. Was the schematic confirmed that you got it from? Hey mark, sent you a pm over at FSB when you get 5 mins. Thanks so much. Just finished this build and it sounds great! Much "tighter" tonal feel than the russian muff I just built, and great sustain and compression. I love the three way mid switch! One side note: I used 5088s and had to reverse the top left transistor...any idea why? Mark, I read your blog every day and have built several effects from your layouts. I am excited to see that you have been really active with the postings lately and can't wait to build some more. Thanks! Thanks for your comments Kellet and I'm glad you're so happy with your build. I have absolutely no idea why your last transistor needs reversing, and am quite surprised by that. The layout definitely requires E-B-C top to bottom so I'm flummoxed why that would happen unless the manufacturer somehow managed to ship out transistors with the case on upside down?! Very weird indeed. I must admit I do prefer my 3 way mid switch to the one you normally find. I don't often use a scooped muff setting but it's nice to have the option as well as flat and boosted mids. Covers more bases that way. If you've built any which aren't currently being shown as verified then please let me know which ones and I'll update the tags. Cheers. I do have a question on this layout. What do the red thick horizontal lines represent? Sorry for noob question, but I haven't come across it before. Thanks! It's something that I do as a guide when I'm putting together the layouts and usually delete after I've finished, but didn't for some reason with this one. It's just a guide for me to show clearly where the 9V rail is so when I need to make any connections to it, I don't have to look very hard to work it out, which helps speed things up and also helps avoid misplaced connections. I do similar lines to show the ground and half-voltage rails as well with some opamp circuits. Here is where I am at with this project. This has been a fun one and its only my second pedal. I think I am hooked on this. Great! Where did you get the 5133's? I got them from a vintage pedal pull from eBay. I seem to be having a problem with this one.. I have been troubleshooting it for 2 days and can't seem to get it to work. Im sure its something dumb on my part. I have check for shorts and also recheck the layout to make sure all cuts were correct and part placement was correct. I also soldered the SW1 directly to the Tone 3 pot since I did not want the switch in the equation yet. Could that be an issue? Here is the voltages from my transistors. Im really new to this. I come from a game console modder so I know basics of soldiering but I have no idea how to use a multimeter correctly. The Sw1 wire shouldn't be soldered to Tone 3. That switch is used to put a cap in parallel with the 4n7 but tying it directly to Tone 3 creates a connection between the tone pot and the collector of Q3 which you don't want. If you don't want to use the switch just ignore the Sw1 wire completely. Modern production 2N5133 produce hiss and they are expensive. I use 2N2484. Electricaly similar, with a hair more gain.